All things considered, this is my favourite cocktail. I discovered it by happy accident one Christmas when my father said I could pick any cocktail from his pocket bar guide and he’d mix it for me. I’d been helping out at the guest house, I think cleaning or restocking the small bar. Being very young at the time I looked for one that had the most alcohol and the least mixer without being either impossible (exotic ingredients, such as absinthe) or disgusting (vile ingredients, such as absinthe). I chose a Sidecar and was relieved to find that I liked it; I’ve been liking it ever since. Other cocktails come and go, but not this one. What I like is the balance, the sour lemon bite, the controlled sweetness of the orange liqueur, the profundity of the brandy. It’s an improbable combination, one that surprises. Looking over the ingredients—and everyone agrees on these, if not on how much of each to use—you expect something different. Think not of three drinks mixed, though, think of something entirely new. It’s a gentleman bruiser, powerful but clean flavoured and elegant. I’m not going to provide my own recipe because I don’t have one; I enjoy the variety and prefer to be surprised. If I’m mixing one myself I’ll probably follow something like the first one below, not least to honour my childhood. I’ll also mostly avoid sugar-rimmed glasses. Where it all began: Michael Jackson’s Sidecar. The bar guide my father used was Michael Jackson’s Pocket Bar Book (1979). It was written by this Michael Jackson, not the singer. 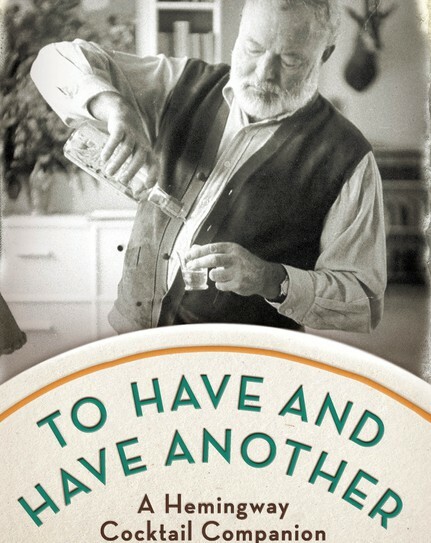 Jackson was best known as a beer and whisky writer, but his laconic and quietly authoritative bar book was my drinking guide when I was growing up, and it’s still the first place I look for a cocktail recipe. My father bought it under the ludicrous misapprehension that guests at a bed and breakfast in the English Lake District circa 1980 would be ordering sophisticated mixed drinks, but there again we had just moved from southern California, where customers were always demanding and always right. Shake thoroughly with plenty of cracked ice, and strain into a cocktail glass. Decorate with the lemon peel. Translated into ratios: 8 parts brandy, 2 parts lemon juice, 1 part Cointreau. Cointreau is a brand of triple sec and others can be used. A ‘cocktail glass’ is the classic inverted triangle shape. There are several newer editions, but they have garish covers and aren’t what I grew up with. Unfortunately, though, there is no edition currently in print. Have a look for secondhand copies, there are a good few out there. Also keep in mind that I’ve probably oversold it, nostalgia being what it is. 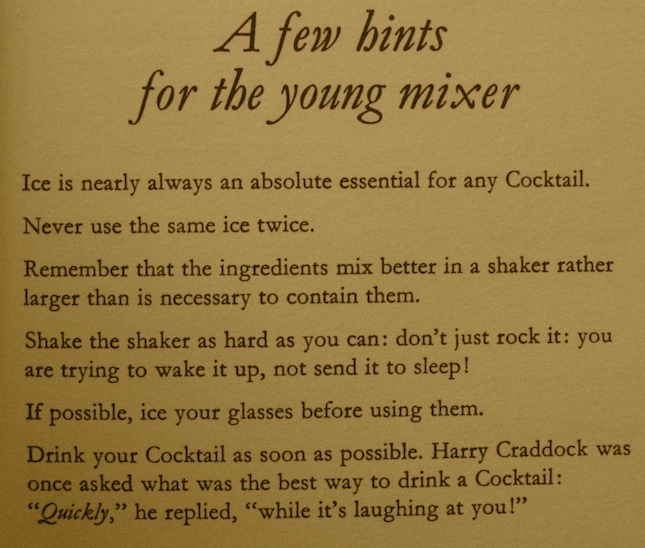 Advice from the Savoy Cocktail Book. Back in the late 1990s I picked up a copy of the 1997 edition of the Savoy Cocktail Book, originally published in 1930. 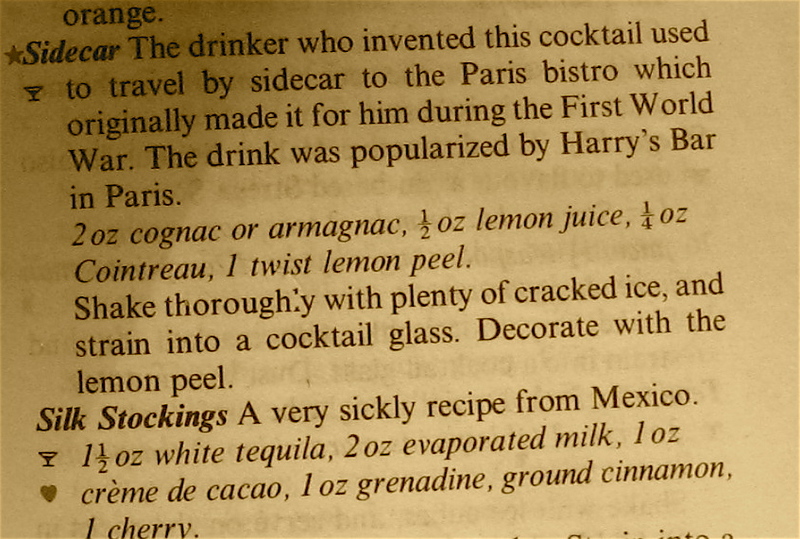 If you drink cocktails, why wouldn’t you want the Savoy’s old mixing book? (A handsome new edition was published by Constable in September 2014.) Naturally, they have a Sidecar recipe. 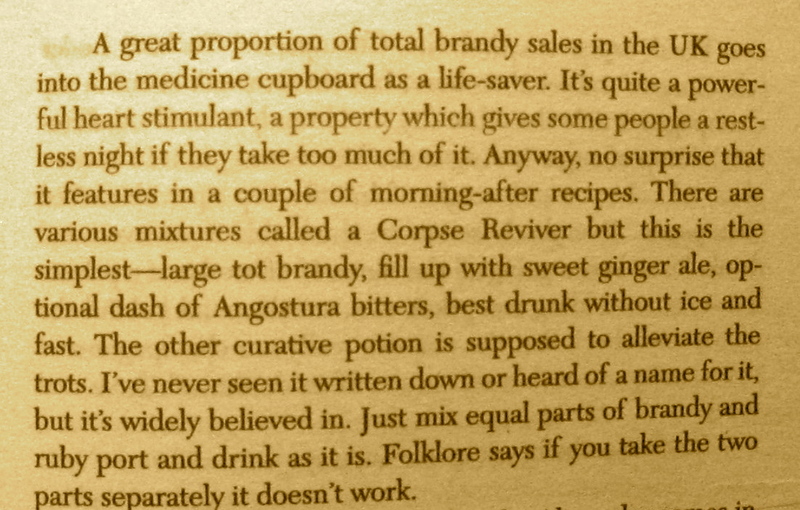 In other words: 2 parts brandy, 1 part lemon juice and 1 part Cointreau. Amis on brandy, the Sidecar’s major ingredient. No one should ever be tempted to underrate ‘the King’ when it comes to drink. Be sceptical, yes, occasionally take with a pinch of salt, yes, but underrate, never. Everyday Drinking (a 2008 collection of his booze writing 1971–84, incorporating several out-of-print books) is a mix of erudition, experience (both bitter and sweet), folklore, things he heard in a bar, humour, and wisdom. The section on hangovers is magnificent, shrewd and beautiful. Some of the advice is sage as you like, some is dangerously entertaining tosh. It’s a fine book. There are dozens of proper cocktails based on brandy, of which the Sidecar is the most famous. Take two to eight parts brandy, one or two parts brandy Cointreau, two parts lemon juice and ice, and shake if you feel like it, though a good stir should be enough. Named after the sidecar that used to carry the inventor of the drink to his favourite bar and, more important, home again. 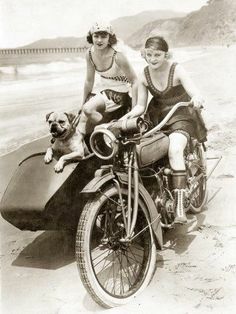 A sidecar is the ideal vehicle for a soak when he’s been soaking—he can forget about the driver and snore away in peace. Amis wasn’t as pedantic as some people think. While I like his looseness about the proportions, there being room for variation, I would always shake it over ice and then strain. Chill a cocktail glass. Rub rim of glass with lemon, then dip it in coarse sugar. Shake ingredients well with ice, then strain into chilled glass. Translated into ratios: 6 parts brandy, 4 parts liqueur, 3 parts lemon juice. Greene also has three paragraphs on the history and origins of the Sidecar, if you’re curious. The provenance of these things has never much troubled me, but it’s fairly interesting. Few cocktails have been argued over as much. Three ingredients, one of which isn’t an expensive spirit or liqueur, shaken over ice and served in a cocktail glass. The hardest part of making them, once you’ve decided on your recipe, is squeezing the lemons. You can make a lot without spending all your time mixing and they’re damned good and look the part. Sidecars are just the thing for the holidays, Christmas day and New Year’s Eve in particular. But then they’re good all year round: very.